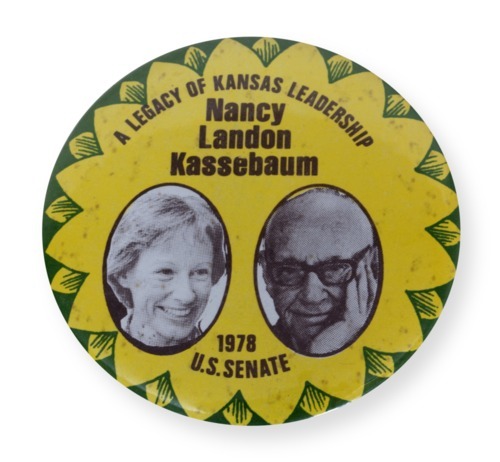 Green and yellow campaign button promoting Senator Nancy Kassebaum. The button reads, "A Legacy of Kansas Leadership." It was used for Kassebaum's 1978 election to the United States Senate. The daughter of Kansas Governor Alf Landon, Kassebaum was born in Topeka in 1932. The button depicts photographs of Landon and Kassebaum, and the sunflower motif resembles material used by Landon in his 1936 presidential campaign. Kassebaum won the 1978 election and served three terms in the U.S. Senate.